Our product range includes a wide range of drip rod with 4 hooks, solid linen bin, foot step double, bowl stand, saline stand and i.v. stand. 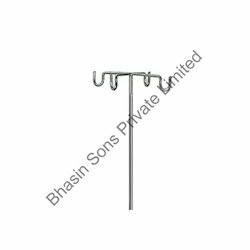 Bhasin sons private limited occupies the leading position in the field of manufacturing and exporting drip rod with 4 Hooks. We manufacture these drip rods with utmost care of our skilled professional to ensure delivering reliable to our clients. The materials used to manufacture these products are eco-friendly which can be recycled. Our products are acclaimed much due to its leak-proof property. It caters a wide range of industrial battery manufacturing purposes. 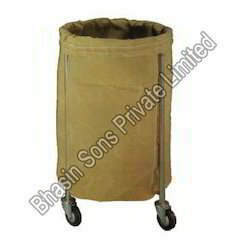 Backed by the sound state- of- art infrastructure, we offer Solid Linen Bin across the globe. The overall size of this product is 910 x 510 mm. It is widely noted for its simple structure. These are constructed using industry leading raw materials. In which the detachable canvas bag enables easy washable facilities and the product is unique by its durable rotating wheels. Mounted on 75 mm dia. castors with detachable canvas bag. Our squads of well-experienced professionals, we are dedicated towards in manufacturing and exporting Foot Step Double. Specially designed step with painted border makes these products ahead. The rubber bushes in the legs safes the floor from the scratch. We are equipped with modern technologies in manufacturing these footsteps. 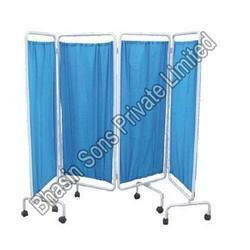 These are highly portable and generally used for the convenience of the patients. Overall Size:460 L x 460 W x 460 H mm. MS tubular frame work mounted on four heavy duty rubber shoes. Both MS Top fixed with antistatic rubber mat surrounded by aluminum angle. Finish in epoxy powder coated. 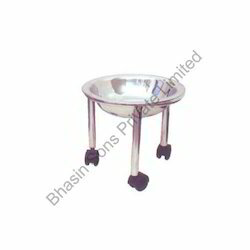 Under able guidance of our trained professionals, we manufacture and export a wide range of Bowl Stand. 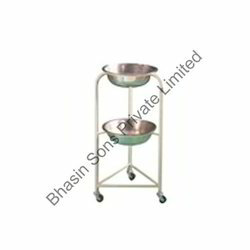 In this bowl stand the bottom is provided with fine wheels that promotes frictionless movements. This is innovative designed to keep the two bowls perfectly. It is commonly placed in the surgical wards of the hospitals and other clinics. Due to its simple structure it can be easily relocate. M.S. tubular frame mounted on three castors of 75cm. Two bowl rings of 35cm fitted one above the another for placing bowls. The expert team in our firm allows us to manufacture and export leading products of Saline Stand (Powder Coated /Stainless Steel). 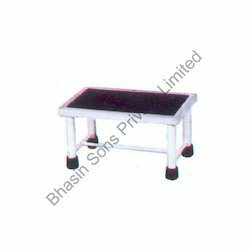 The most reputed and good-will earners, Bhasin Sons Private Limited procures raw material from trusted and the loyal vendors to manufacture an extensive range of products in a cost-worthy manner. These products are used in a plentiful range at all hospitals throughout the globe. This product can be migrated to any part of the hospital. We are widely involved in manufacturing and exporting I.V. Stand. The double hook with the strong stand makes this product best in the industry. In The stand the special screw is attached which enables to adjust frequently. We manufacture these stand using excellent quality steels to meet the international competitions. These are comes in various sizes according to the customer choice. 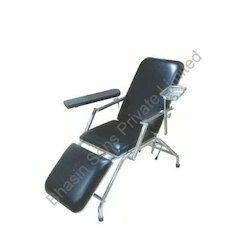 Our expert team allows us to manufacture the Blood Donor Chair all over the globe. We manufacture these products using finest quality raw materials purchased from leading vendors around the globe. These products are used at an ample range at blood banks and hospital labs. This product is designed uniquely with stylish arm chair and also an expandable foot rest. The elegant look and trendy features attracts our client’s enormously. Bedside Locker General is one of the best product, we are manufacturing and exporting all over the world. These lockers are made up of high-grade aluminum alloys. It is remarkably featured with a durable plastic bush with precision fixed and compact drawers attached at the lower end. This product is used at stationary stores and also used as doctor’s main desk. We manufacture this product with extreme care and unique look. Stainless steel top assemble on tubular legs. Finish in epoxy powder coated. Backed by the sound state- of- art infrastructure, we offer Bedside Locker Deluxe across the globe. Our technicians are very conscious in testing these products before delivering it to the market. 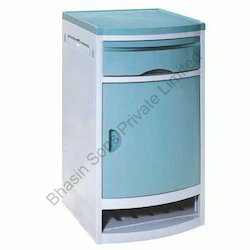 This Bed Side Locker is famous for its security, machine pressed complete locker box, closed from three sides and a suitable drawer for extra storage. It finds its applications widely hospitals and clinics, which we offer at diminutive price. Bed Side Screen 4 Fold is one of the first-rate products that have a wider acceptance in the market. These are made of high quality steels and pure plastic. It is well known for its knock down construction. More over the plastic curtains are easy to washable. The special feature of this product is 4 folded structures. We prefer these products mostly for surgical wards. 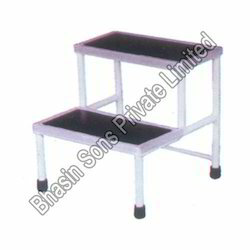 We at, Bhasin Sons Private Limited are engaged in manufacturing and exporting a wide range of Foot Step Single. These are of square shapes which are mainly noted for its thickness, stability and robustness. Our range is manufactured using fine stainless steel that is anti corrosive in nature. We prefer these steps widely for hospitals and other health centers. It is available with us at a diminutive price to please our clients. Overall Size:460 L x 230 W x 230 W mm. Single MS Top fixed with antistatic rubber mat surrounded by aluminum angle. 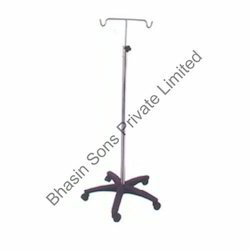 We are the leading manufacturers and exporters of a wide range of Swab Rack. Using hi-tech technology and machinery, we are manufacturing these Swab Racks to deliver zero-defect products. 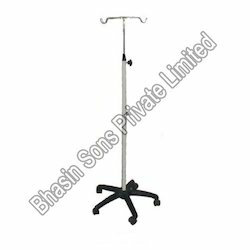 These racks are widely used in hospitals for taking swabs, which is provided with Stainless Steel Tubular Framework, mounted on 10 cms castor diameter, with Eight Rows, Six Hooks in each Row and Stainless Steel tray fitted at Bottom. We offer these highly-prized products at a very cost-worthy price all over the world. 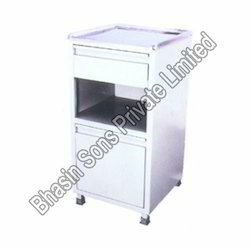 Bhasin Sons Private Limited is one of the leading names in the field of manufacturing and exporting Kick Bucket all over the world. The size of this bucket is 12"x 14" which is comfort to use and requires less amount of space to place. In order to maintain the quality these buckets are manufactured using industry leading steels available in the market. These are also available in various sizes at pleasing price. Our products are widely appreciated for its longer service life. Backed by the sound state- of- art infrastructure, we offer Bed Side Screen (3 Folds). We manufacture these rods using high-grade steel and screening cloth materials that are in compliance with International Quality Standards. 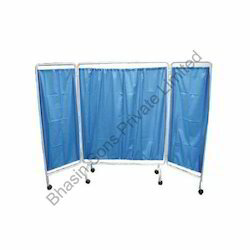 These side screens are used at maternity wards for separating two patients and also in conducting tests for the patients. This product is designed with translucent nature along with long lasting durability. Overall Size : 168H x 244W cms. Frame work made of CRCA tubular pipe in three folds mounted on 5cms castors. Supplied with spring wire and curtains. 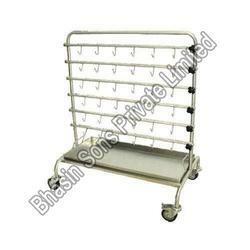 We hold the expertise in manufacturing and exporting Bedside Locker. This product is uniquely designed with supreme quality raw materials along with prolific features. The compact size and attractive knob attached drawers provides lots of space for the user. 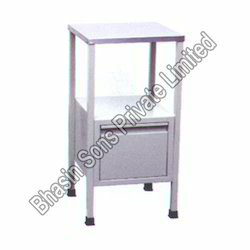 This trolley is used in a large scale at office rooms and cinema theatres. The stylish look and contrasting colors marks our product leading one in market. Looking for Ward Equipment ?